Crosley’s Stack-O-Matic Technology ensures you’ll once again be able to enjoy your favourite hits uninterrupted, one after another. With a fully automatic swinging motion, the arm reaches the stack and marvellously drops your next favourite album gracefully on the platter stack up to six records for hours of listening pleasure. Exclusively from Crosley Radio, Stack-O-Matic Technology is sure to amaze you with this new spin on an old favourite. Many a home today features a high-dollar home theater system, which, while providing fantastic sound quality, offers little in the way of decorative value to any interior design. 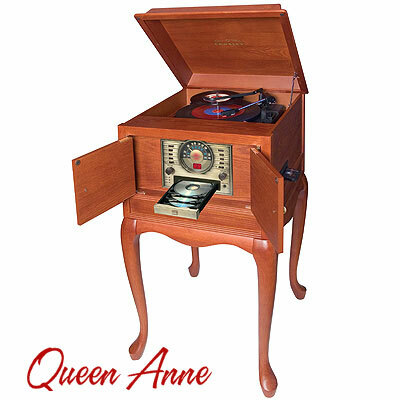 Crosley's Queen Anne Stack-O-Matic ™ Console fills that void. Perfect for the living room or den, where the surround sound doesn't reach, this 1930's Queen Anne style unit has it all. Constructed of high-quality hardwoods and finished in a deep hand-rubbed paprika, this beauty discreetly features a Stack-O-Matic™ Record Changer, a 3 disc compact disc player complete with search and program features, a side mounted cassette deck, and an AM/FM radio with full range speakers and built in amplifier. Note: We do not recommend stacking 78's because of the age and thickness of them. Special Note: Extra needles designed specifically to fit the Stack-O-Matics are available. 30 per pack of 45 RPM inserts (spindle adaptors). Permits 45 rpm record play on any phonograph or record changer with a standard spindle. Locks into place, holds securely, and snaps out easily for removal.